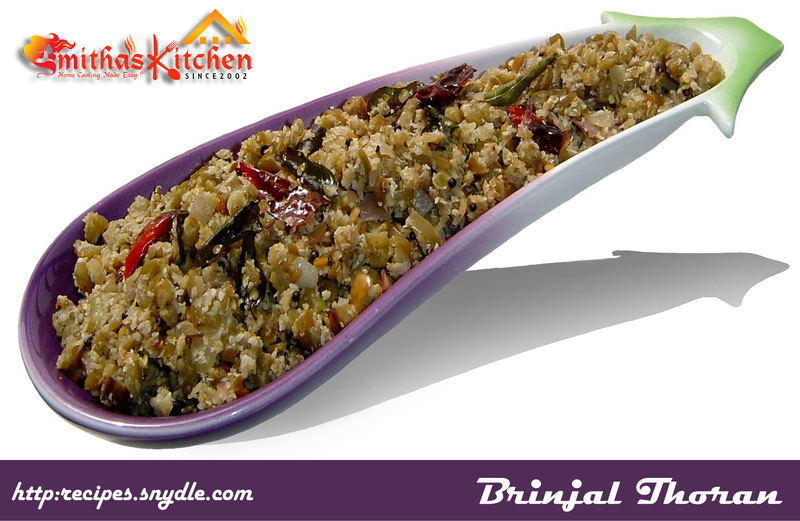 Here is a very simple and tasty recipe of Long Brinjal Thoran which goes well with rice and chappati as a side dish. Heat the oil in a non-stick pan and splutter mustard seeds, curry leaves, dry red chilli, split black gram. Add onion and sauté well until becomes light brown. Meantime grind coarsely together grated coconut, cumin seeds, shallots, green chilli and keep it aside. Once the onion gets cooked, add chopped brinjal and sauté well. Add ground coconut mixture, salt and mix well. Close the pan with a lid and continue cooking in steam for about 5 minutes on low flame. When the brinjal gets cooked about 50%, remove the lid and continue sautéing gently on medium flame until all the moisture gets evaporated from the brinjal.